This is what my colleague casually pointed out to me as we were walking the streets of this crazy “wild child” of a city early this year. Baffled I looked at them speechless. What is it I didn’t know exactly? In recent years I have felt pretty confident wandering around Naples. Although I’ve never been one for history (thankfully we work with a local team in Naples and 100’s of guides throughout Italy to share this these important facts with our guests). However, I felt pretty certain of my deep connection with this city over many others in Italy. 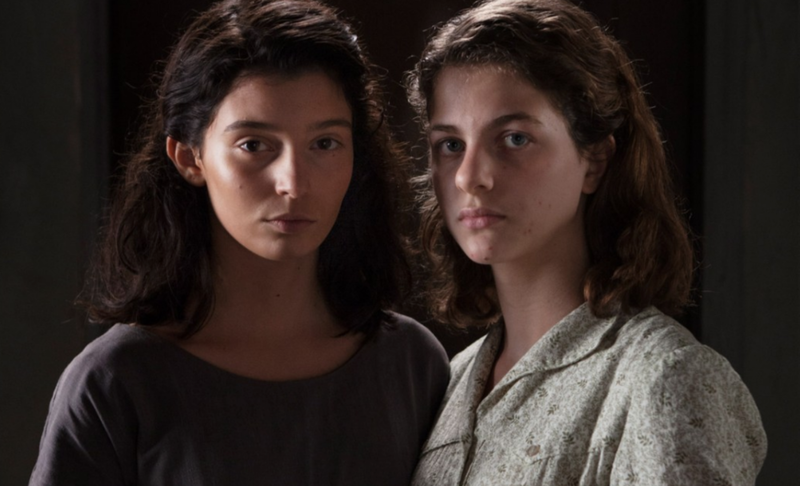 No I did not grow up like the fictional characters, Elena Greco or Lila Cerullo of “My Brillant Friend.” And no I didn’t have a Neapolitan mother, family, or even grow speaking Italian (although most of the older generation of my family did). Like many others, I used to be fearful of Bella Napoli. Then I finally took the time to explore the city and spend significant time trying to see from a local’s point of view. I felt proud the day I had finally gotten over my fear. As well as confident enough to share my thoughts and knowledge on the city. Yet, at this moment, when my friend made this comment I started to question myself. Maybe I didn’t really know Napoli as well as I thought. This is when I decided to take another approach. I’ve already been visiting the city for years. Everything, I learned was from my local friends (who work in the travel business there in the city center) or my ex’s family. So I had to think outside the box. I decided, my winter mission in NY was to finally dive into the Ferrante series. Since this was based in Naples and people were coming to the city just for this, I figured this could be the answer! In 2017 when “living” in Naples for a month, I have already tried to read these novels, several times to be exact. I’ve tried immersing myself with a glass of Aglianico wine in my temporary apartment near Piazza Borsa. I also would try to set the mood by picking a sunny spot on the Lungomare in Chiaia and Mergellina. I’ve even tried escaping the city out on a Saturday, like many others locals do in the summer, to read while on the beaches of Sorrento. While I was out of the city I had a great view of Mt. Vesuvius so I figured I would still feel inspired. Eventually I gave up and moved on to a book that was more cheerful and romantic. This was until the series “My Brillant Friend” was launched on HBO. Then the “Ferrante Fever” finally began to hit me. SO WHY AM I REALLY SO CONNECTED TO NAPLES? As I mentioned earlier I am not Neapolitan. I was born in New York to a family of a 1st generation Sicilian father. I obtained my dual citizenship, from the small town of my nonna in Agrigento. However, somehow after the passing of my father, Italy became my life. And shortly after that it brought me right to the Campania and Naples area. When in NY, I found myself spending most holidays and dinners with family friends from Avellino and Campania. Then in my early 20’s I spent time as a tour leader in Italy. Eventually and most likely not coincidentally, I was assigned to the area of Campania and the Amalfi Coast. I later returned backed to NY to only meet and then almost marry a Neapolitan pizzaiolo. When that relationship ended I started my business and new life. I moved half my year to Italy only to meet a family in Naples that wanted work as my main partner in Italy. This is when I realized although I had travelled all 20 Regions of Italy and there were plenty of places to immerse myself, there was no escaping Naples . Getting back to my point, this is probably why the Elena Ferrante novels intrigued me so much. While I haven’t finished the book series, I still feel confident enough to share my review. I realized this may be one case where the TV/Movie version is better (personally for me) to understand the story and author. My point of writing this article is to share my thoughts on this series as someone who has experienced Neapolitan life in a unique kind of way. I always see myself as “Half Italian” and “Half American” (not Italian American) so it’s also really fun for me to share my perspective from that point of view as well! Below you will find my thoughts. You will also find information on how you can see and experience some of the “Ferrante Fever” while in Naples this coming year. Those who have read the book, understand that everything is really about Lila. Lila was Elena’s best friend, sort of mentor, and worst enemy (in some aspects). Her personality was contradictory. Lila was soft but vigorous, rugged but gentle. She is the representation of how I see many Neapolitans to be. Lila’s role is what motivated me to keep watching and learning more about the book and the story behind the characters. While Lila set the tone, I became more intrigued by the role of Elena or as they called Lenu`. I always felt sorry for her. She was trying to survive in a dishonest and harsh environment. She did her best to fit in, stay strong, take care of herself, and be loyal to family (especially her difficult mother) and Lila. I immediately felt I needed to support and root for her on throughout the series. Another draw to this show was the Neapolitan dialect. The series is all in Italian with the spontaneous burst of Neapolitan here and there. English speakers do not fear! They include subtitles for each episode. I was surprised but at the same time not surprised how much of the dialect I understood (without the subtitles). Napolitano was a “language” I spent 8 years of my life trying to understand. While watching I was having flashbacks of all kinds. One one of my flashbacks that stood out the most was from 2009. During my tour leader days we would spend almost every Friday on the island of Capri from May - September. I became friendly with some of the locals and they always made sure to start my morning with a laugh and/or a lesson. I could hear the boat captains in Capri (Pasquale and Gianluca) screaming the words into my ear (You know how many people do that with language, thinking if you scream louder you can hear more)? “Vott o carr pa scesa, VOTT-O-CARR-SCESCA.” I never did pronounce it right nor did I fully understand if it meant go with the flow or take it easy. Either way, the phrase and that memory only came back to me while watching Lenu` on the island of Ischia during episode 6. Spaccanapoli is a very cool, important, and must see area of Naples. In fact the city center of Naples is a UNESCO World Heritage site. So I am not taking any credit away from it’s importance. It’s gritty, curious, and full of good food and local life. It’s amazing to visit and many of our guests want to see it during their first visit to Naples too. However, most people do not realize there is a lot of Neapolitan life beyond this area. The series instead brings you to a side of town which probably would never be known otherwise. Ferrante also brings you through some of the central areas and historic sites such as Galleria Umberto and Piazza del Plebiscito showing you that Naples is not all gritty and chaos. In fact, during the show Lenu`, Lila, and friends get to experience a very rare walk through the chic and wealthy sites of this area in the 50’s. Naples was and still is full of different kinds of lifestyles. And this is why I always encourage our guests with a bit more time to get a little taste of each part of the city during a visit. Many feared that Ferrante’s stories would bring more negativity towards Naples. And as she suspected, it did the opposite. Her honest and authenticity left many curious to understand learn more. I personally am hoping this keeps motivating people to see beyond what has been showcased in the past before they make any judgement. Brava Elena! Quick Travel Tip: To experience a chic part of Naples in modern day try taking a walk through Vomero and Posillipo. WHO DOESN’T LOVE A GOOD ITALIAN WEDDING SCENE? The traditional wedding scene in the TV Series is everything. It’s the finale that (obviously) ties it all together. A good ol’fashion Italian wedding is what brings a bit of that Sopranos and Godfather that everyone was secretly waiting for. I read somewhere that the director wanted to pull it from the show but Ferrante insisted. She of course, was right. The very part of the last act is most important. But don’t worry, no spoiler alert necessary. However, if you did see it free to message me or comment about your thoughts on this! Because while I was sad, I was not shocked. 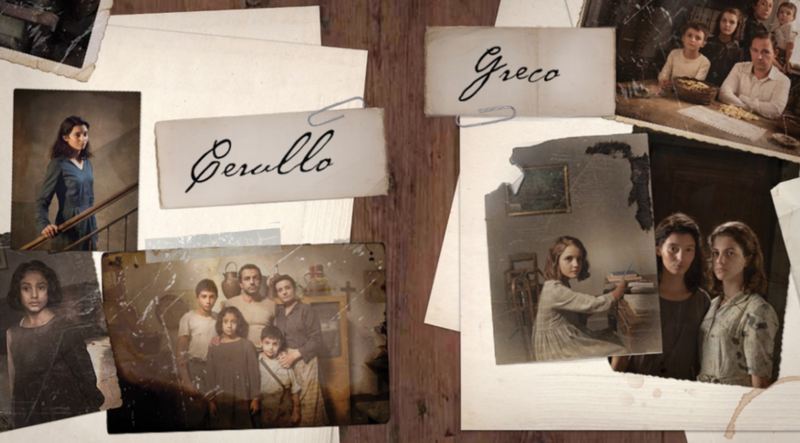 Once I got to episode 2 of season 1, I became obsessed with the show like I am with Naples itself. I started to dig deeper and research. Was there really an Elena and Lila? I wanted to know more. While researching I became distracted with other history and realizations. For example, I started making my own comparisons. Does anyone else see how Lila is a lot like the famous Pulcinella. I guess it may seem far fetched but hear me out. I read a blog written by a man named Jeff Matthews. Read his description of the famous black masked man that lingers through Napoli then tell me if you get it. To me, this reflects Lila. It’s this love hate feeling. She brings strength and joy but causes a lot of pain. And to be quite upfront this is a feeling and situation I’ve come across quite a bit with Napoli in the past 8 years. I know that sounds deep and dramatic but WAIT! Before anyone goes and gets offended just let me finish. A lot (not everyone as I have good friends there) but a lot of the people I have personally met here are particular. They are blunt, but reserved. Strong but full of generosity and kindness. You are not sure if you can or want to trust the, love them, or run as far as possible. There is always more behind what you see. Yet, you always end up loving and trusting them anyway because of their heart, passion and persistence for everything they do and keep around them in life. It’s this kind of mystery that keeps me immersed in the back story of Naples and the story behind this book series. SO IS THE STORY REAL? I failed at my attempt to learn more about the life of the author. I came up empty handed. Which seems about the same as every blogger, reporter, writer, and journalist experienced too. In fact no one has actually ever met the author Elena Ferrante. Some have even questioned if she is real. I have even heard some accusations questioning if this was actually written by man! I smirked when hearing about her mysterious life. This is so typical for a Neapolitan. She took the time share her heart and soul. Then left us wondering and waiting for the next big thing or truth to reveal. We do not even know the point of her sharing this story? Did she want to become famous, get even with a friend? Was she hurt or maybe just bored. WHERE IS THE SHOW REALLY FILMED/BOOK BASED? The area of the show is based around the Naples’ Gianturco train station or the area of Rione Luzzatti. This is only 10 minutes from the apartments where I usually stay when working in Naples. Once a very much overlook area is now attracting visitors for Ferrante Series Walking Tours (which we offer as well). Since I refused to engage in the novels for the past few years, it’s my partner team that created this tour. As native guides leading the tour, naturally they are proud supporters of the series (both TV and Book) and their city. Part of the series is also based around the are of Aragonese Castle in Ischia. For the TV show I was told select beach scenes were filmed in Gaeta, Italy. However, overall it’s based on Ischia. As a true Ferrante fan you may want to make time to also visit this island. 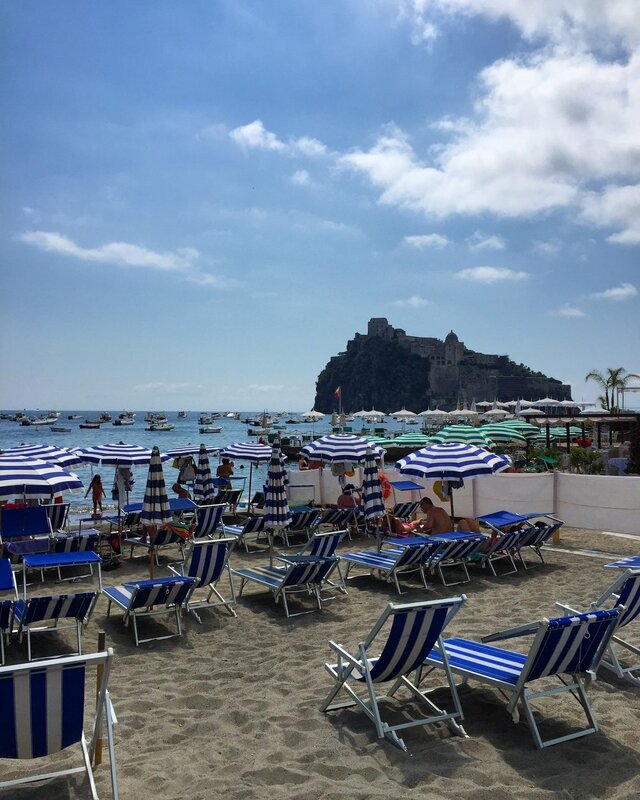 Ischia sits just about 60-90 minutes by boat from Napoli city center is easily accessible by boat. And yes, we offer services here too. Two quick things to note. The Naples “neighborhood” was recreated in the area of Caserta. Therefore the filming did not actually take place there. Your tour will reflect a visit of the area based on the book. Just keep in mind while it’s cool to explore the area of Rione Luzzatti, it’s not a common place you may find yourself just randomly wandering and enjoying when in Naples. I recommend exploring with a guide. SO IS WHAT IS YOUR OVERALL TAKE ON IT? As I mentioned earlier, I haven’t personally read every book yet. At this point, I am not sure if I will ever immerse myself fully in the books or just follow the HBO series (since I have become so attached to the visual characters). However, from what I have seen so far, it’s worth (binge) watching and trying to read. I see it as a real and edgy way to look into the Naples lifestyle. Novels like this, although dig deep, often allow you to understand a city more and fear it less. Naples needs that right now. As a UNESCO World heritage site it’s deserves a little loving here and there. Even if it’s not a love at first site kind of place. ANY OTHER THOUGHTS TO KEEP IN MIND BEFORE WATCHING/READING? YES! Watch every scene without judgement. Why? Because throughout the series you will find that the bad guy is good then bad is then good again. It’s hard to keep up in that sense. So don’t place titles on anyone. Just stay focused on the story line between Lenu` and Lila. Just try to live it, feel it, breathe it. Ferrante’s series’ goes beyond what you have heard during your travels or know from the books about Napoli. As I keep saying, it goes deeper then that. So don’t waste time with assumptions. I was trying to put into words my emotions about what I have watched. Then I read a write up by Guardian. In the beginning of this article I talked about being told “I really didn’t know enough about Naples.” Is this true? Was I lacking knowledge and do I now know more now because I immersed myself in the Elena Ferrante “My Brillant Friend” series? As far as art and history, I would say I am still about the same. I forever will be learning about Caravaggio or the famous paintings in the Museo Nazionale di Capodimonte. However, after finishing “My Brilliant Friend” I feel proud to say this. I actually DO know enough about Naples. Sure I may bleed Sicilian, been born in America, never studied history, and only travel Naples during my 6 month yearly stay in Italy. However, I have a feeling I had and still have access to a unique look inside this city that some may never get. I believe I understood the deeper story that Elena Ferrante was trying to share through all of this (without my knowledge of Caravaggio) so I am going to go with that. Naples, is the city that has me repeating the cycle of love, loss, love, loss over and over again. That’s why just like Lenu` feelings towards her friendship with Lila’s, I keep returning. It’s the heart underneath that tough rugged body that always pulls me back in. “My Brillant Friend” can be found on HBO Demand. For instructions on how to watch it online see here. Please remember this show can only be found in Italian with English subtitles. There is no English version. This is what makes it great! To participate in your own private tour based on the novel contact our Custom Travel Planning department. For the 4 Book Series in English click here. For the series in Italian click here. Stories for italophilie for italophile. Newer PostMeet us in California!